The Perfect real estate photograph is made up of three perfect sections which include; the real estate piece/unit in question, the surroundings or background and lastly the sky which hangs above them all. The beauty of each these parts have their roles in real estate photography and we shall be focusing on the sky section and how editing skies in real estate photos can enhance the overall image. There is no such thing as the perfect natural skyline while in the act of taking a photograph therefore, most real estate units are photographed without the man behind the camera placing much emphasis on the skylines beauty which leads to unappealing or gloomy skylines that are detrimental for a succesful real estate portfolio. But this situation can be remedied with the use of image correction software and techniques to create a more picturesque background for your real estate images. 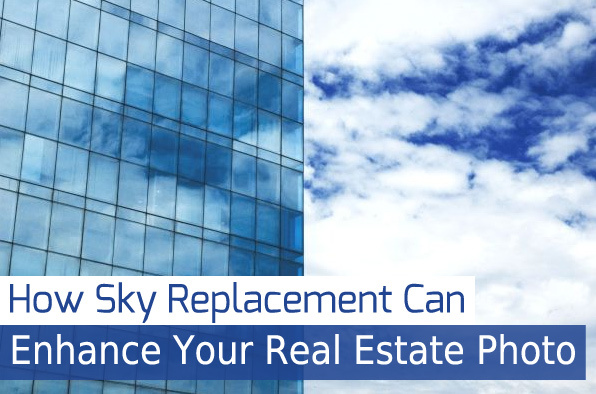 In some cases, real estate images are taking close-up which totally eliminates any view of the skyline or projects and imperfect picture of the sky. These imperfections hamper the aesthetic beauty of the image’s surrounding/background and as every real estate agent knows, making your listings appeal to a buyer’s taste increases one’s chances of making a sale. Image corrections such as adjusting the building’s distance by zooming out and applying sky replacement techniques to totally revamp the skyline would make the photos perfect for your real estate portfolio. Manipulating sky colour is a very important technique for it can be used to set the mood of a real estate piece, set the time/ weather I.e. give the photograph an autumn, summer, dusk or dawn skyline. Image correction tools can also be used to darken the skyline or give it a uniform sky blue tint in such a way that it looks natural to the viewer. In real estate, colour changing helps the agent set whatever mood he or she wants for his buildings. Sky replacement enhances a photograph by placing animate or inanimate objects such as flying birds, planes, moving clouds, rainbows etc. With a view to creating a more natural feel of the real estate surroundings or adding extra colour features to beautify the photograph. The skyline can also be created with a natural blend of different sky layers to create a spell binding effect on the viewer. Skylines for real estate photographs can also be animated with the use of 3-D software to create a highly descriptive version of the 2d image. 3D sky replacement techniques usually incorporate simulations, such as flying birds and moving clouds for a more realistic effect during presentations. To enhance your real estate images with image correction software, you are advised to pay close attention to achieving a natural look by blending the replaced skyline to fit the lower backgrounds to avoid under editing or making the picture look and feel fake/retouched.